For more than half a century, Lincoln Wood Products has been dedicated to the production of quality windows and patio doors. Our products are designed and crafted not only for beauty, but also for energy efficiency, smooth operation and low maintenance. Most window and patio door problems encountered by homeowners are avoidable. Simple measures such as properly cleaning the glass and screens, lubricating locks and hinges and finish maintenance will help ensure many years of service from your windows and patio doors. With a little care and consideration, your Lincoln windows and patio doors can look and operate like new for years to come. Your Lincoln products come with a comprehensive warranty, which is attached to each label on the product. Most windows consist of two primary components; a frame and a sash. The frame, which is the portion attached to your wall, has two side jambs, a head jamb and a sill. A sash, which is the part that holds the glass, is made up of two horizontal rails and two vertical stiles that surround the glass. Sash may be operable or stationary. Direct set windows consist of a frame and glass – no sash component – and are always stationery. On every window there are glazing beads - small strips of wood that secure the glass in place. Windows may also have optional grilles (sometimes called muntin bars). These may be removable interior wood grilles, grilles between the glass (GBG), true divided lites or simulated divided lites. Simulated divided lites are permanently affixed to both the interior and the exterior of the glass to give the historic appearance of true divided lites while maintaining today’s energy efficiency requirements. Condensation is the fog that is evident on the glass of your windows. This is the same fog that appears on the outside of a cold glass during the summer. Condensation is actually the result of high humidity levels in your home. It generally appears as moisture or ice on the interior of the glass. The problem is more visible on the glass of your windows because the surface condenses more easily. This means that the glass has the lowest temperature of any visible surface in your home. It needs to be noted that if moisture is visible here, it could be happening elsewhere as well. Problems such as peeling paint, rotting wood, mildew or moisture spots are typical symptoms of condensation. The cause of the condensation is too much moisture in the air in relation to the temperature of the surface on which the moisture condenses. When warm air meets a cooler surface, it condenses. This creates the visible moisture you see on the surface of your windows which is similar to your cool glass windshield of your car. Condensation also occurs when the flow of warm air is restricted from reaching window surfaces causing the warm moist air to cool and loose its ability to retain higher moisture levels. Humidity is the amount of moisture in the air. It may come from various sources. Your home needs a certain amount of moisture, but deciding how much you need is a critical decision. The following recommended humidity levels will help you with the moisture level of your home; reducing humidity while maintaining comfort. It is based on the inside relative humidity for a 70° indoor temperature. It is also important to note that for each degree cooler than 70° the interior relative humidity should be reduced an extra 2%-4%. If there is moisture on your windows, it is important to check your entire home. Problem areas could reveal themselves as damp spots on ceilings and walls. The end result could be the moisture passing through the walls, insulation, and to the exterior walls causing peeling or blistering paint or other damage anywhere there is a vapor barrier. This could eventually cause rotting of the frame of the building if left untreated. As stated before, moisture may come from a variety of sources. The following is a list of average daily living activities and how much moisture a family of four contributes to their living environment, which can add up to more than 18 gallons of water per week. When a new home is built, a great deal of moisture is released from the building materials such as wood or plaster. Since newer homes are manufactured more air-tight, there is typically no outlet for the humidity to escape unless steps are taken to vent the moisture during construction and the first few heating and cooling cycles. During the winter months in cooler climates, the moisture will be released into your home. This circumstance usually occurs only during the initial heating season. Some regions are more prevalent to condensation than others. Generally areas that reach 35° Fahrenheit or below in the winter months are more susceptible to condensation. Interior condensation is more likely in the initial heating months of winter or during a severe, rapid change in temperature over a short period of time during the winter. This happens when moisture in the air contacts a surface whose temperature is lower than the dew point (the temperature in which air manufactures dew). This symptom should gradually dissipate during the season. Exterior surface condensation usually occurs on sultry, humid summer days, typically when an air conditioner is being used. This creates a surface temperature on the glass below the dew point. Humidity within a home will fluctuate at different times of the day as well. Generally the highest humidity readings occur at night or in the morning when the occupants are conducting the daily activities that cause humidity levels to rise such as bathing, cooking and laundry. Some window types, such as bays and bows, are more subject to condensate. Because they are more exposed to the environment, these windows may be somewhat cooler. Also, due to their shape, there is a lack of air movement within the window. One solution to this problem is to make sure that the window is properly insulated upon installation. Contact your contractor or insulation specialist for further details. Another solution is to use a fan to promote air circulation. Another concern might be the type of window coverings that are being used. Those that are close to the windows restrict the flow of warmer air and can contribute to a condensation problem. There are several steps that you can take to reduce your indoor humidity level. The most important one is to make sure your home is properly vented. Install vents in all areas such as attics and crawl spaces and make sure they are always unblocked. Many people cover attic vents or louvers for the winter thinking that they are keeping cold air out, not realizing that they are also keeping moisture in. Install exhaust fans in rooms with high humidity levels such as bathrooms and kitchens. Make sure they are used during and long after taking a bath/shower and cooking. Also make sure that exhaust fans and appliances, such as clothes’ dryers and gas heaters, are properly ducted, sealed and vented to the exterior of the home, not into a crawl space or attic. Gas appliances should be a major concern. Water vapor is one of the by-products of gas combustion. Lincoln highly recommends the use of an air exchanger. Combined with the use of ceiling fans and dehumidifiers, condensation can be drastically reduced. A temporary solution for severe cases would be to open a window in each effected room for a short period of time. For more specifics on these and other ideas, we recommend consulting a heating and ventilation specialist. Choose a wood window instead of a metal one. Wood is a much better insulator than metal. Also, make sure your windows and doors are Energy Star™ certified. Make sure that your contractor has considered the most appropriate way to keep soil moisture from permeating the basement or foundation. Proper insulation is one of the most valuable tools in any energy efficient residence. But many people often forget their water pipes and cold air ducts. Any pipes (such as cold water pipes) or ducts that condensate in the warmer months should be covered with insulation that has an exterior vapor barrier. Wood is a natural material and must be protected from the elements. Initial painting/staining and regular maintenance is necessary to achieve a long life product. Failure to paint/stain the exterior of your Lincoln product immediately after installation will void your warranty. Two coats of top quality exterior latex paint are recommended. For proper paint selection see a qualified paint professional in your area. Be sure to follow the paint manufacturer’s instructions. NOTE: Top coats must lap on the glass by a minimum of 1/16”. Because wood is a natural product, variations of wood grain, color or texture may be experienced. Lincoln cannot be responsible for these color variations, and will not consider them a defect. Refer to Lincoln’s Limited Warranty. Consult with your paint professional for proper preparatory procedures to minimize these differences. A good quality pre-stain sealer is recommended in order to balance stain absorption between different grain densities of wood. Follow the paint manufacturer’s application recommendations for this process. Pre-stain sealer, stain and two coats of varnish or primer and two finish coats of paint are recommended. NOTE: Top coats must lap on the glass by a minimum of 1/16”. 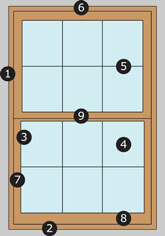 Sash of windows and panels of doors should be painted/stained in an open position or removed completely from the unit. Allow paint/stain to dry thoroughly before reinstallation or closing of window/door products. Be sure to protect any vinyl parts or weatherstripping from contact with paint/stain. Paint/stain may cause these materials to harden or become brittle and not perform their intended function. Do not paint/stain any parts that rely on friction contact for performance, (i.e. sash edges of glider and double hung windows). On all other units except the glider and double hung, the sash edges should be painted or stained. Patio door panels must be sealed on all edges. Six sides for wood doors, five sides for clad doors. Patio doors both wood and clad must be sealed immediately after installation (see door sticker). After installation, install handle set to avoid water and moisture from getting into door. Lincoln Wood Products, Inc. cannot be responsible for a door product that is not properly sealed or maintained. 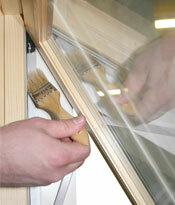 Improper painting or finishing of your Lincoln window/patio door products will void your warranty. Field applied accessories, such as brickmould, spread mulls, panning systems, etc. and assembly of Lincoln fabricated products by others are not included in Lincoln’s warranty. Some Lincoln products utilize Cellular PVC (cPVC) material on exterior parts. Cellular components replace traditional wood materials in rot-prone areas. This may include exterior trims, sills and sill nosing. These white cPVC parts do not require painting (they only need to be cleaned with a good quality multi-purpose cleaner); however we recommend the sealing of all nail holes, cracks and gaps on the exterior. If you choose to paint the cPVC parts, the use of 100% acrylic latex primer and exterior latex paint is recommended for application of light colors only (L Value of 50 or lighter). Example: Sherwin Williams Duration paint with VinylSafe color technology – available in 100 standard colors or custom colors using their Sher-Color computer custom matching system. If a dark color (L Value of 50 or darker) paint is used, excess solar heat may be absorbed, subjecting the cPVC material to warping and distortion due to extremes of thermal expansion and contraction. This reaction is even more evident when these parts are exposed to direct sunlight in hot climates. Paint adhesion loss, blistering and peeling could also result. NOTE: Lincoln does not recommend painting cPVC parts with dark color paints unless a good quality heat reflective paint is used, and that it is applied according to the paint manufacturer’s recommended application instructions. Failure to use heat reflective dark color paints on Cellular PVC parts will void your warranty and Lincoln will not be responsible for repair or replacement of any resulting damage due to distortion, warping, paint blistering, or peeling of paint on the Cellular PVC parts. Consult your paint professional for proper paint selection. Because wood is a natural product, variations of wood grain, color or texture may be experienced. Lincoln cannot be responsible for these color variations, and will not consider them a defect. Consult with your paint professional for proper preparatory procedures to minimize these differences. A good quality pre-stain sealer is recommended in order to balance stain absorption between different grain densities of wood. Follow the paint manufacturer’s application recommendations for this process. Patio door panels must be sealed on all edges. Six sides for wood doors, five sides for clad doors. Patio doors both wood and clad must be sealed immediately after installation (see door sticker). After installation, install handle set to avoid water and moisture from getting into door. Lincoln Wood Products, Inc. cannot be responsible for a door product that is not properly sealed or maintained. 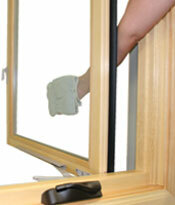 Improper painting or finishing of your Lincoln window/patio door products will void your warranty. Clean the glass as soon as dirt and or debris become apparent. Products such as Windex® and Sparkle® work well for routine hand cleaning. A mixture of one part vinegar with ten parts water is also an excellent cleaning product. Lincoln does not recommend alcohol-based or ammonia-based cleaners as they tend to leave visible streaks. Start cleaning at the top of a particular wall or window and work your way down. Apply the liquid liberally to the glass surface and wipe with a lint free towel or cloth. Use a squeegee or clean soft cloth with clean water, to remove the cleaning solution from the glass as well as the frame and surrounding materials. To prevent streaking, stop wiping when the glass is almost dry and there is still a uniform film of moisture on the glass. This film will quickly evaporate leaving a clean surface. NOTE: Do not wipe with a dry cloth or when the surface is dry. For stubborn dirt or foreign materials, such as grease, oil, tape adhesive, paint and even crayons, standard glass cleaner may not suffice. For these instances, products such as Soft Scrub®, Denatured Alcohol, Acetone or Goof-Off® should be used. Apply a small quantity of the liquid to a clean WET cloth. Rub on the surface requiring spot cleaning. Wipe clean and follow up with the routine cleaning procedure given above. NOTE: Do not wipe with a dry cloth or when the surface is dry. The interior of the surface of the Dual Low-E Glass has a thin pyrolytic coating which gives it an improved thermal performance. The low emissivity coating has a very fine, hard texture which requires a slightly different cleaning procedure when compared to regular glass. Follow the Glass Cleaning procedures above with one exception - Never use a squeegee on the low emissivity surface. While metallic objects, such as razor blades or steel wool should never be used to clean glass surfaces, it is especially important when working with Dual Low-E glass. The low-emissivity surface on the interior of the glass is actually harder than the metallic objects and a thin layer of the metal may be removed from the object and deposited on the surface of the glass which may appear as a ‘stain’ or ‘scratch’. These cannot be removed by routine cleaning. For the removal of metal marks, you will need to use products such as Acid Magic®, Steel Glo® or Muriatic Acid. Apply a small quantity of the liquid to a clean wet cloth and rub on the glass surface until the mark is removed. Wipe clean and follow up with the routine cleaning procedure to remove any residue left by the specialized cleaning liquids. NOTE: Do not wipe with a dry cloth or when the surface is dry. NOTE: Never spray products such as Acid Magic®, Steel Glo® or Muriatic Acid directly on the glass surface. The over-spray of these liquids may damage non-glass window components such as wood, vinyl or silicone. Follow the Glass Cleaning procedures for Neat® glass. Neat® glass products should require less maintenance on the exterior. Lincoln recommends removing Preserve® films within six months of installation. Follow the Glass Cleaning procedures if glass cleaning is required. To clean your screen of dust and light debris you may use the upholstery brush supplied with your vacuum cleaner. Heavier debris such as kitchen grease may be removed by gently scrubbing with mild soap and a soft brush. Screens should be rinsed to remove dirt and soap residue. Be sure that screens are dry before they are re-installed. All Lincoln products require periodic inspection and maintenance. Inspect your Lincoln product at least annually. How often maintenance is required will differ based on local climates, exposure, amount and quality of finish used. Should you notice any signs of separation from wood, cracking or peeling paint, or gapping between materials, scrape or sand affected area and reseal with paint or caulk. Caulk all cracks or separations with a paintable quality sealant. Clean aluminum clad and vinyl products with mild soap and water. Aluminum clad can be waxed with a light automotive type wax to renew luster. Failure to properly maintain your Lincoln product will void your warranty. 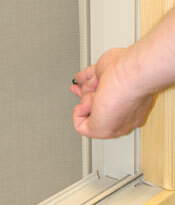 Crank-out casement screens are mounted on the interior of the window. The screen is held in place by springs at the top. To remove the screen, lift the rail at the bottom and pull up and back over the operator. Once the operator is cleared simply pull the screen down and into the building. Your Lincoln casement is provided with standard hardware that will allow you to open the window to a full 90° which will allow access to clean the exterior of the window when the screen is removed and the sash is fully opened. 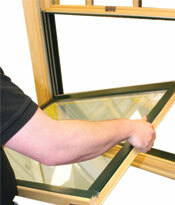 NOTE: Casement windows with special egress hardware will not allow this reach out feature. These windows will need to be washed from the outside. Should the sash to frame relationship fall out of adjustment over time (the space between sash and frame equally spaced around the unit), the hinges are adjustable. To help keep your casement windows operating smoothly it is important that the tracks and hinges are cleaned of dirt and debris on a regular basis. To keep these parts clean, brush them with a small dry paintbrush. Lubricate with a Teflon spray if necessary. Raise the bottom sash as far as possible. Grasp the two screen plungers, near the bottom of the screen, simultaneously pull them toward the center of the screen and push the screen outward. 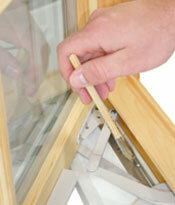 When the exterior of the window frame has been cleared, grasp the sides of the screen frame and pull down and out. Rotate the screen approximately 45° and pull the screen to the building’s interior. 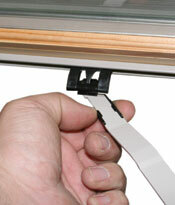 For cleaning purposes, double hung sash may be tilted in and/or removed. To tilt, unlock and raise the bottom sash approximately 4” to 6”. 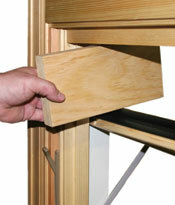 Tilt latches are located on each side of the bottom sash check rail. Simultaneously push both release levers toward the center of the sash. This will allow the sash to be tilted toward the inside of the building. Carefully tilt the sash in. At 90° the carriage blocks will lock in place so that they will not raise or fall in the jambliner. 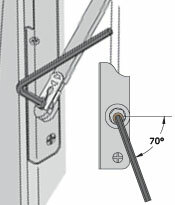 For complete removal tilt sash 90°. In this position, lifting one side of the sash higher than the other will allow removal of the sash from the frame. If need be, the sash can be tilted past 90° and gently rested on the sill to facilitate cleaning the outside of the sash from inside the building. The top sash may also be tilted and/or removed. Lower the sash 4” to 6”. The top sash tilt latches will be visible on the top rail. Following the same release procedure as the bottom sash will allow the top sash to be tilted and/or removed for cleaning. Reverse process to replace or reposition sash. NOTE: To tilt the top sash the lower sash must already be either tilted or removed. Crank-out awning screens are mounted on the interior of the window. The screen is held in place by springs on the top. To remove the screen, lift the rail at the bottom and pull up and back over the operator. Once the assembly is cleared, simply pull the screen down and into the building. 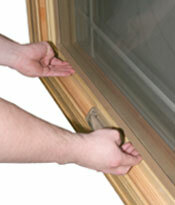 Once the screen is removed, crank the window open 30° to 45°. At this point you may pull the retainer clip back and lift the arm locking mechanism away from the slide shoe mounted on the sash track. With this disconnected you will be free to lift the sash to 90° which will enable you to reach out to wash the outside of the sash. IMPORTANT: After the sash is disconnected it must be held open by blocking it in place or with the aid of another person. 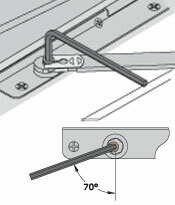 In the event you should experience hinge chatter or bouncing during closing on your awning, you may tighten the small screw located on the hinge shoe. Tighten the screws on each hinge shoe equally until the problem is corrected. Be careful not to over tighten the screws. To keep your Lincoln awnings operating smoothly it is important to keep the hinge tracks free of dirt and debris. To keep the tracks clean, brush them with a small dry paintbrush. Lubricate with a Teflon spray if necessary. 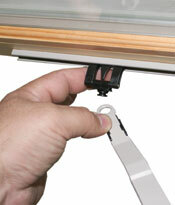 Unlock the window and move operating sash to cover the stationary sash (fully open position). Grasp the two plungers, located on the side of the screen, and simultaneously pull them toward the center of the screen while pushing the screen outward. With the full screen option, this may require two people. 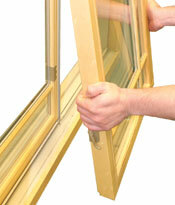 When the exterior of the window frame has been cleared, grasp the sides of the screen frame and pull down and out. Rotate the screen approximately 45° and pull to the building’s interior. Move the inside sash toward the stationary sash and past the anti-lift device (sash should be centered). Grasp both sides of the sash and lift to clear the bottom track. In order to replace the glider sash, simply reverse the removal process. Occasionally you will need to clean the head and sill tracks using a mild soap and water solution (do not use abrasives or solvents or any cleaner that may contain petroleum distillates of any kind on these parts). As needed, a light coat of paraffin wax or spray furniture polish may be applied to the tracks in order to lubricate them. If your slide patio door panel does not operate smoothly it can be adjusted via the two adjustment screws located at the bottom inside face of the operating panel. To adjust the door, remove the plugs covering the adjustment screws. Using a Phillips screwdriver adjust the operating panel up or down being sure to keep the panel square with the lock side jamb. Turning the adjustment screws clockwise will lower the door panel while turning the screw counter clockwise will raise the panel. Be sure to replace the plug covers after the adjustments are completed. This will help to keep the rollers clean. 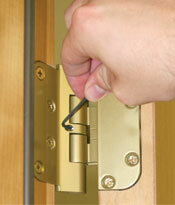 After your door is adjusted, latch and keeper adjustment may be necessary. To make sure that your patio door closes correctly, the keeper may be adjusted up or down until the latch engages properly. It is also possible to tighten or loosen the latch mechanism on the door by using the adjustment screw on the edge of the latch. If your rolling patio screen does not operate smoothly, it may be adjusted via the two adjustment screws located at the bottom vertical screen frame edge. Use a small Phillips screwdriver to adjust the bottom rollers up or down until the screen rolls smoothly. Make sure to keep the screen square to the lock side jamb. It is important that the sill track be kept free of dirt and debris. To clean, vacuum loose dirt and debris as necessary. Wash tracks with mild soap and water as needed. 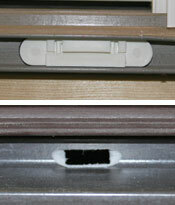 There are weep holes on the exterior edge of the sill and at both jamb edges viewed from the interior. They must be kept free of dirt and debris. Lincoln swing patio doors are equipped with SET hinges and GUIDE hinges that can be adjusted to square the operating panel within the frame. Set hinges allow for 1/8” vertical adjustment-hex head screw is located under the hinge pin finial cap. The guide hinge provides 1/8” of horizontal adjustment and has a visible hex head adjustment screw on the leaf face. Prior to adjusting, determine that the frame is plumb, square and level in the rough opening. 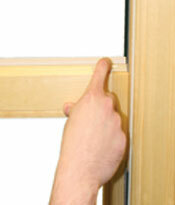 If discrepancies are found, take corrective action on the frame prior to adjusting hinges. These instructions denote a right-hinged door viewed from the inside. If door is left hinged, simply reverse the procedures. Maintain approximately 1/8” of clearance at the head jamb. 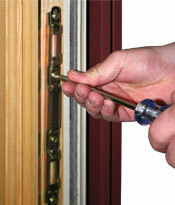 After adjusting be sure and check the latch operation. 6/6, 6/8 and 7/0 height doors are equipped with three hinges; 8/0 & 9/0 high doors have four hinges. The top hinge moves the upper part of the door, the center hinge(s), will adjust the panel vertically and the bottom hinge will move the base of the door. 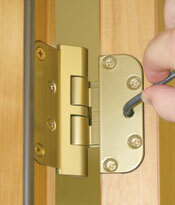 When adjusting, hinges should be manipulated to ensure approximately 3/32” clearance on the hinge side. To pull the door closer to the hinges, turn the horizontal adjustment screws counter clockwise. 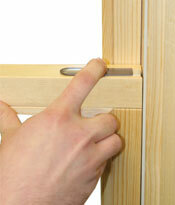 To push the door closer to the latch jamb, turn the horizontal adjustment screws clockwise. Remove the press-fit finial cap from the bottom of the set hinge to expose the adjustment screw. Use a small screw driver for plastic finial caps and the putty knife for brass caps. Insert the hex wrench in the bottom of the set hinge. Tighten the screw to raise the panel and loosen to lower the panel. Reinstall the finial cap removed in step 1. 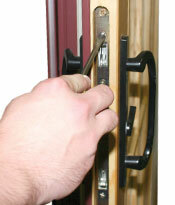 For doors with two set hinges, establish desired height with the top-most set hinge. Adjust other set hinge as follows: turn adjustment screw 1/8 turn past the onset of resistance to distribute the panel weight evenly. Insert a 3/16” hex wrench into the horizontal adjustment screw. Turn clockwise to decrease the margin and counterclockwise to increase the margin on the hinge side. It is important that the sill be kept free of dirt and debris. To clean the sill, vacuum when necessary. Wash sill with mild soap and water if needed. Always be sure that weep holes on the inside and the outside of the sill are free of dirt and debris. If necessary the retention chamber of the passive weep system can be blown out with compressed air. Components come with a plastic shipping clip installed. 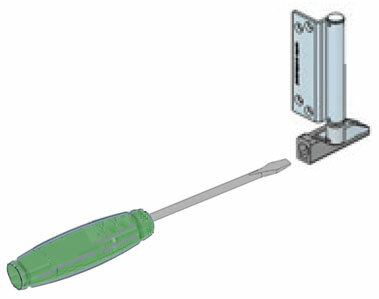 Insert a flat-bladed screwdriver into the slot and rotate the pin. When correct adjustment is reached, remove the shipping clip. Carrier pin will snap into place when the blade and slot are aligned. To readjust, pull the blade down to disengage it from the slot, replace the shipping clip and rotate the pin. Remove shipping clip after final adjustment. Insert flat-bladed screwdriver into slot and rotate. Utilize both top and bottom wall pivots to maximize adjustment range. It is important that the sill track be kept free of dirt and debris. To clean the sill, vacuum when necessary. Wash tracks with mild soap and water if needed. 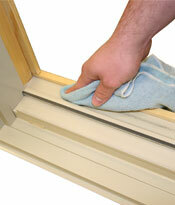 Always be sure that weep holes on the inside and the outside of the sill are free of dirt and debris. If necessary the retention chamber of the passive weep system can be blown out with compressed air.